The doctor showed me the PET scan from two weeks ago and how the previously bright chest nodes no longer show up (either the chemo killed the cancer cells or the irritation, if that’s what it was, has subsided). A bit off the subject, I asked him why such images were usually backwards, with left and right reversed. He said it was because they are from the camera’s point of view, below the rib cage looking up toward the chest. That explained all the “backward” images I’ve seen when browsing the internet. 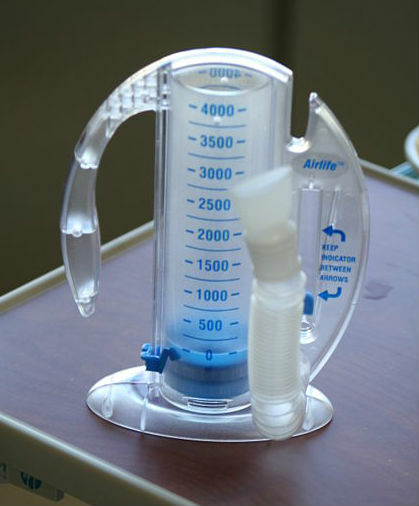 Incentive spirometer. The user inhales through the mouthpiece, trying to raise the blue piston as high as possible. He moved the 3D image up and down, explaining what the various gray shapes were — different organs, etc. Then he showed me the shadowy area at the top of my left lung. That was one of the areas that had collapsed during my surgery (atelectasis). Obviously it is not yet normal and is a likely cause of my persistent cough. He’s going to consult with the pulmonologist, who may want to run a pulmonary function test. Meantime, he told me to get busy again with the incentive spirometer I was given after my surgery. It’s a way to practice deep inhalations, which help reinflate the collapsed air sacs. The current problem, of course, is that deep inhalations usually make me cough. Oh well, I’ll keep trying. Meantime, with a cough being the problem, the doctor doesn’t want to complicate the issue by starting the Herceptin treatments — cough being one of Herceptin’s possible side effects. So he’s postponing the Herceptin until I finish my radiation treatments. Meantime, I hope to finally beat down the cough. Canceling the Herceptin infusion left a gap of several hours before my radiation treatment. Even with lunch, which included a very long walk to and from the cafeteria, there was a lot of time to kill. And I find waiting around frustrating and exhausting. Today was my fifth radiation treatment (of 33). So far, so good. No noticeable pink or change of any kind except possibly just above my collarbone. Hard to tell for sure since my neck is tanned and always exposed. I’ve been applying lotion twice a day since the first day. So far I’ve just used some mild Jergens that I had on hand, but I’ve ordered some Original Healing Eucerin (without the exfoliating acids) and some Aquaphor, both highly recommended for skin irritated by radiation treatments. (Baby Aquaphor is same formula as regular Aquaphor.) The idea is to avoid all alcohols and acids (irritating), paraben (mimics estrogen), and perfumes (irritating). I’d rather have the right lotions and not need them than need them and not have them.